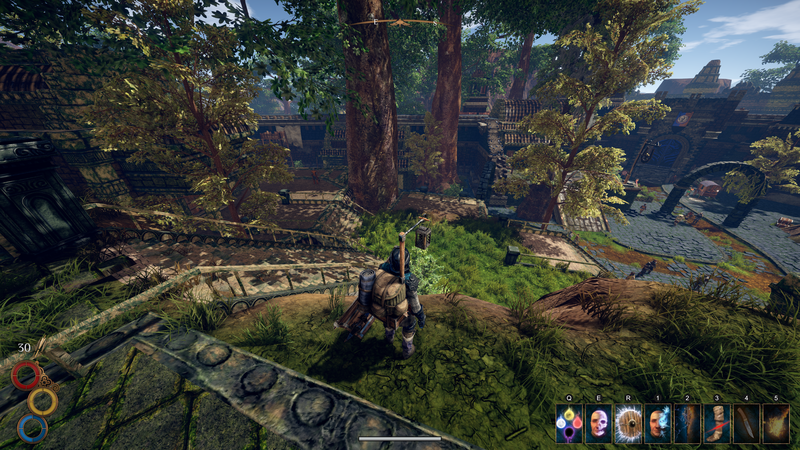 In my review-in-progress of Outward last week, I touched on how the title's difficulty doesn't stem directly from overtly-punishing combat encounters or elaborate and tricky dungeons, but rather the breadth of mechanics that a player must overcome due to Outward's focus on survival, exploration, and the relative ambiguity of its quest design. And honestly, for the first dozen or so hours it felt like a breath of fresh air. 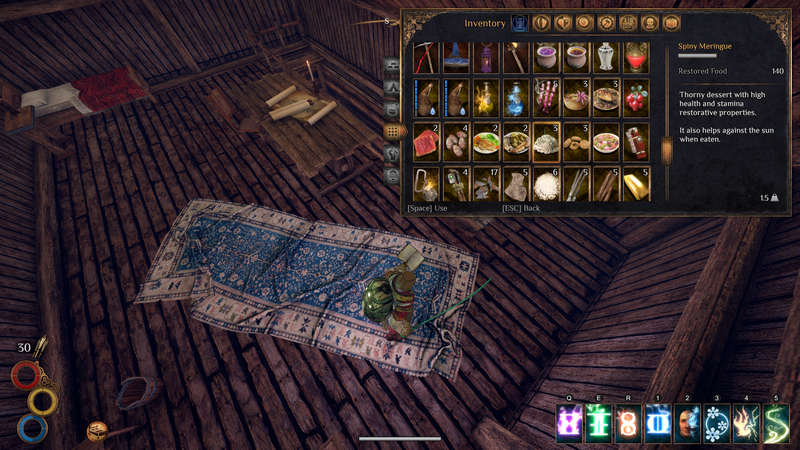 For the first time in a long time, I had to weigh my options about how to spend my limited currency, I had to ask myself if I was 'ready' to go embark on a quest to complete a story-based objective, and I had to check over my gear and inventory to make sure I had everything I needed, and decide what to leave behind. In short, it felt good to find that prep time could easily pay off. Unfortunately, what started out feeling rewarding at first ended up feeling tedious eventually, largely due to undertuned mechanics and a lack of other interesting ways to engage with the game. 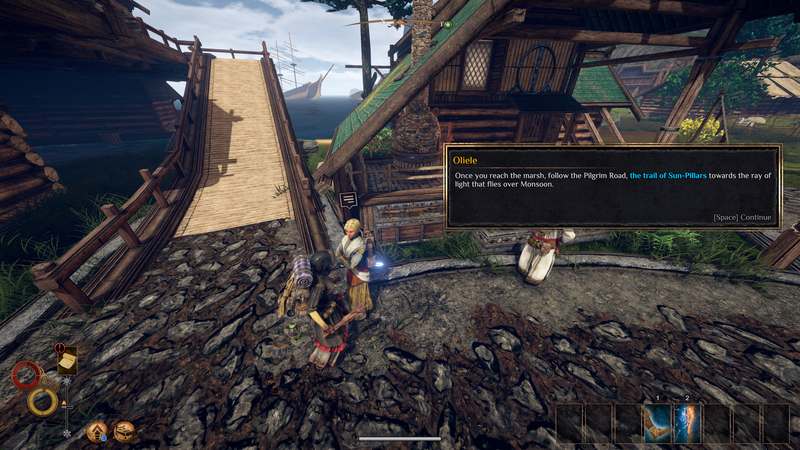 Outward opens up with the player surviving a failed expedition and a near-fatal ship wreck and waking up in their coastal hometown of Cierzo. Upon coming to, they'll quickly learn that they owe a (seemingly) large sum of money in order to pay off their accrued Blood Price, essentially a debt incurred by the player for their excursion before the outset of the game. 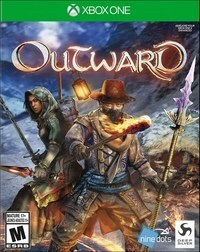 After solving an initial quest to make a payment on the debt, Outward opens up into the story proper, where three key NPCs in town end up heading towards three other regions of the world - the Enmerkar Forest, the Abrassar Desert, and the Hallowed Marsh, with each area having its own threats and hardships to overcome. Each zone of the game features a unique style, biome, and soundtrack as well, with the Hallowed Marsh being a personal standout on most of those fronts. 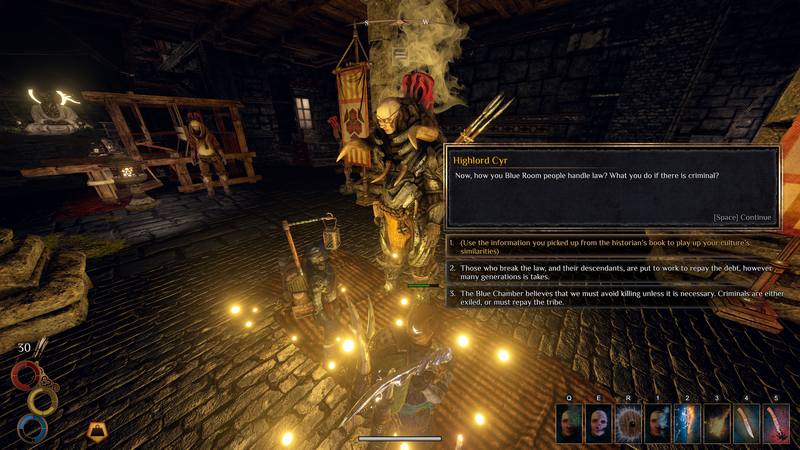 Each NPC will insist that the player should consider following them and joining one of the world's three key factions: the Blue Chamber Collective, the Heroic Kingdom of Levant, or the Holy Mission. Not every key piece of info will be logged in your journal. Having everything divvied up so neatly into triads isn't exactly realistic, but Outward is more concerned with establishing an interesting playground with a unique set of rules rather than putting forth an immersive world that's 101% logical. It's a bit abstracted, in a way, but manages to not detract from the experience for being too "game-y". 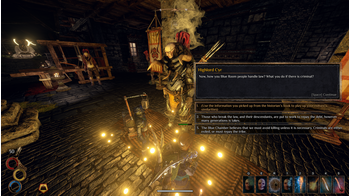 Each of these three factions plays an interesting political role in Outward, and none is strictly presented as being more correct or moral than the others. The Holy Mission speaks directly to the Goddess Elatt, and serves as a religious mediator of sorts for the world's various kingdoms, but could be considered to be somewhat heavy-handed. The Blue Chamber acts as a governing council of loosely allied factions, and will often flex its military might in order to enact its own vision of justice, but is depicted as being susceptible to bribes in return for favorable judgmental dispositions. The Heroic Kingdom of Levant is probably the most intriguing of the trio. 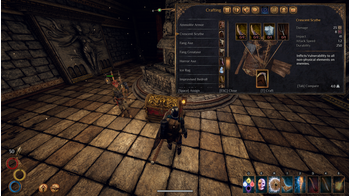 Before the events of the game, the flourishing Old Kingdom of Levant (referred to in-game as "Old Levant") was ravaged by an otherworldly scourge known as the Corruption and lost its status of wealth and power in the region of Abrassar. When a mercenary faction was able to drive back the threat, the Holy Mission establish the new (current) Kingdom of Levant under their rule, despite the misgivings of the Blue Chamber, which continues to recognize Old Levant instead. Levant is probably the most visually striking of Outward's key cities. This political disagreement generally serves as the primary wedge between the three factions, while the lingering threat of Corruption serves as their unifying tether. It's actually a pretty nifty dynamic overall. Each story ends up covering the same general plot, starting and ending at the same place over a series of quests -- though the routes taken ends up feeling fairly different. I played through the Blue Chamber questline first and found it to be very disjointed with a lot of backtracking, fetch quests, and important events happening off-screen, resulting in an incredibly short and disjointed ending. However, I thought that the Heroic Kingdom line of quests felt a lot more cohesive, and better prepared the player for understanding the events that take place at the end of the story. I definitely significantly more underwhelmed with the former versus the later. While I found the political overtones generally interesting and thought they established a unique premise for Outward's narrative setup, the plot clearly takes a back seat for Outward's focus on item management, survival, and crafting mechanics. Even the voice acting is awkwardly implemented and only covered a seemingly random portion of any bit of dialogue. This is not a story-driven game. Not only must players keep track of their health as they explore the game world and overcome all manner of enemies ranging from native beasts to magical entities, they must also keep track of their general well-being. Hunger, thirst, and rest meters must all be maintained in order to be able to efficiently explore, and falling below certain thresholds for any given metric will incur penalties to attributes like stamina regen and the like. While this initially seems daunting and incentivized me to always ensure I had a healthy supply of food and drink along with me for any questing, it quickly became apparent that these mechanics end up feeling undercooked, and I often found myself over prepared with even the smallest modicum of foresight. The hunger and thirst meters drain very slowly relative to the abundance of food and drink items that can be found or easily cooked, and I hardly ever had to worry about sleep. Resting is designed to be crucial for mantaining your health, but you'll likely not need it as often as you may think. I did not once find myself at risk of not carrying enough food or water to maintain my overall health, and instead often found myself with the opposite problem of having too much food spoil on me for having carried it around too long without actually needing it. Food would instead be most useful for its various other benefits such as providing a long-lasting stamina or health regen, or even more specific buffs such as an increase to your character's movement speed -- a great thing to have considering the amount of ground that has to be covered at times, since there's no fast travel. Unlike hunger, I would sometimes find my character thirsty, but water is incredibly plentiful, and drinks like various healing teas don't spoil like food items do, so I was never at risk of not having something on hand to immediately remedy that. Having an overabundance of food rotting before you end up needing it ends up being a bigger deal than actually managing your character's hunger. Less easily managed compared to hunger and thirst is the player's body heat -- failing to prevent extreme heat or cold can result in similar negative effects, including illness if not properly managed. Outside of Cierzo, winter climate can arrive suddenly and without warning, while the desert of Abrasser swings wildly between hot and cold depending on the time of day. Unfortunately, this whole system also ends up not being a major concern overall, because it doesn't come into play for many of the game's locations. These major weather effects only factor in two of the four regions present in Outward, and for winter, it's only about half of the time. The Marsh and Forest regions hardly ever have any inclement weather to speak of, and neither do most interior dungeons or towns (there's one cave that's explicitly hot, and maybe two that are glacial-like caverns). For the most part, it basically only becomes something to worry about when traveling between places, and even then, only consistently in the desert. It comes across like an afterthought past a point. 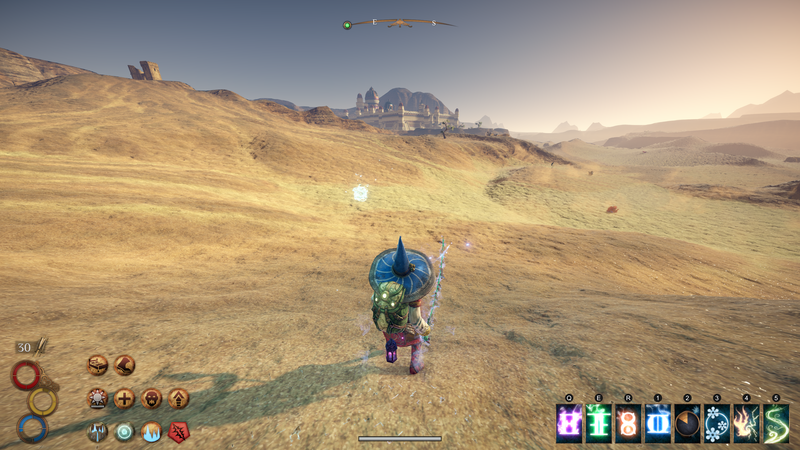 The Abrassar Desert is the one region in game that feels appropriately hostile. Making all of these survival mechanics even more forgettable are cheap passive abilities you can buy from trainers that increase your natural resistance to weather and hunger, making them even less impactful. All of these components are very manageable beforehand, and become all-but-trivial one you train against their effects. It was disappointing to see a major thrust of the game become so unimportant before the end. 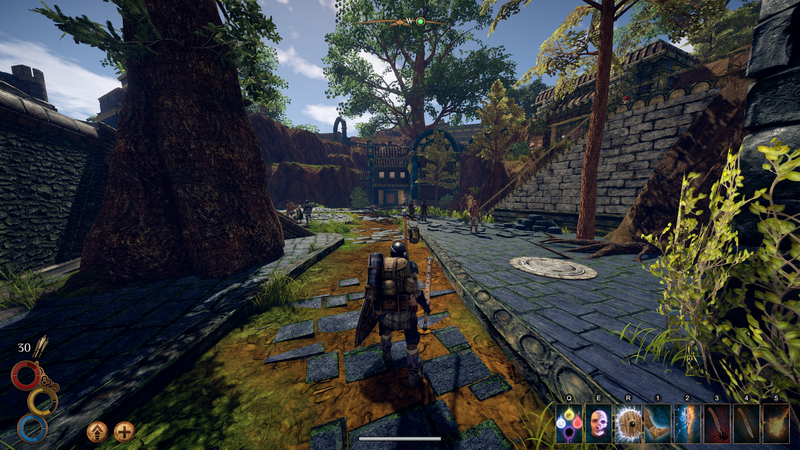 Some aspects of Outward's gameplay that I did like were the backpack and lantern mechanics that do manage to couple well with the management-focus of the game. 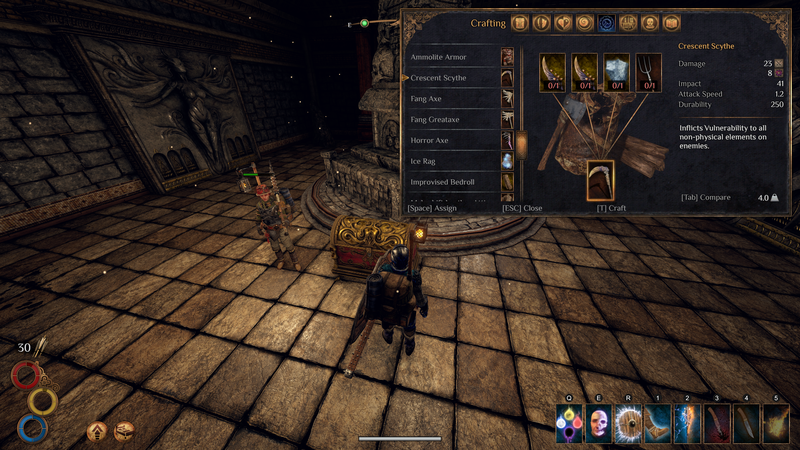 Lanterns (and light sources in general such as torches or similar spells) become highly important when traveling through dark caves or outside at night. 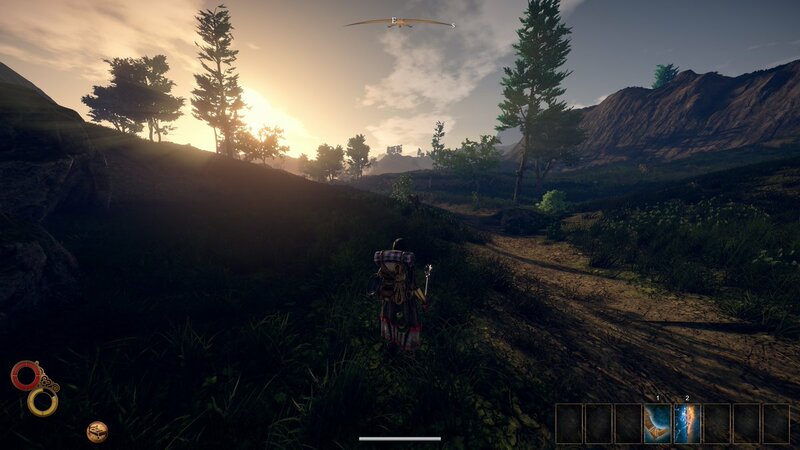 Nine Dots clearly made the lighting and shadow systems in Outward a focus, and they stand as the highlight for the title graphically. Shadows stretch and scrunch when cast across the landscape as your backpack-mounted lantern swings back and forth. Light sources able to be placed above or in front of the player appropriately illuminate further ahead of than one mounted below a pack, and lit torches can even be dropped to brighten a dark tunnel or even deliberately thrown to discover exactly how deep a nearby pit is. It's honestly really neatly implemented. Crafting is a key way to ensure you stay reliably stocked with useful items. The trainers that teach the passive abilities mentioned above will also allow players to specialize in various classes-of-sorts by spending more currency for more specialized techniques. Each region of the game will have different sorts of trainers, ranging from Spellblade hybrids to magic-focused Philosophers. Each player is granted three 'breakthrough' points that they must spend to fully specialize under any discipline but can take a smattering of low-level abilities from each without limit. These abilities can range from minor self-buffs to devastating high-level spells. 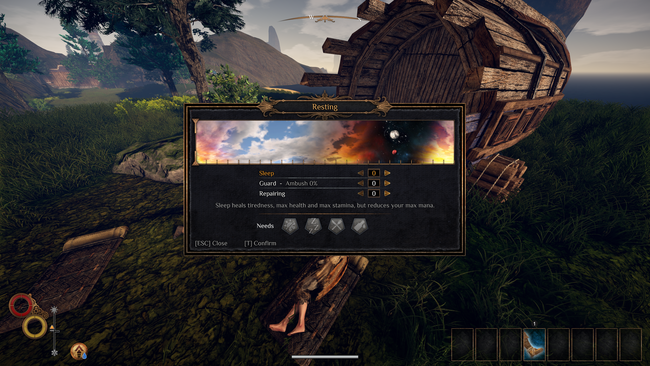 In addition to this, some weapon-specific techniques can be taught by specialized NPCs not clearly identified as trainers (such as the acting King of Levant being a Spear-using expert), and story-based objectives will also reward abilities, both passive and active, unique to each faction's questline. Combat in Outward is a relatively simple affair. There are three major meters at play: health, stamina, and impact (alongside mana for the spell-casters). Melee abilities and dodge rolls will incur a stamina cost, and taking hits will deplete both your character's health as well and their impact meter. 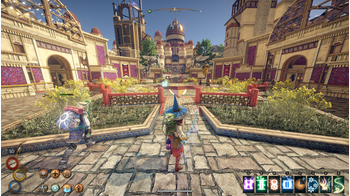 Different weapon types and spells will be more effective at targeting either meter, such as axes doing high health damage in general, with maces and clubs dealing greater damage to impact. Reducing an enemies impact below 50% will stagger them briefly, while depleting it completely will knock them over, leaving them vulnerable to attack (with some abilities doing extra damage to knocked-down opponents). 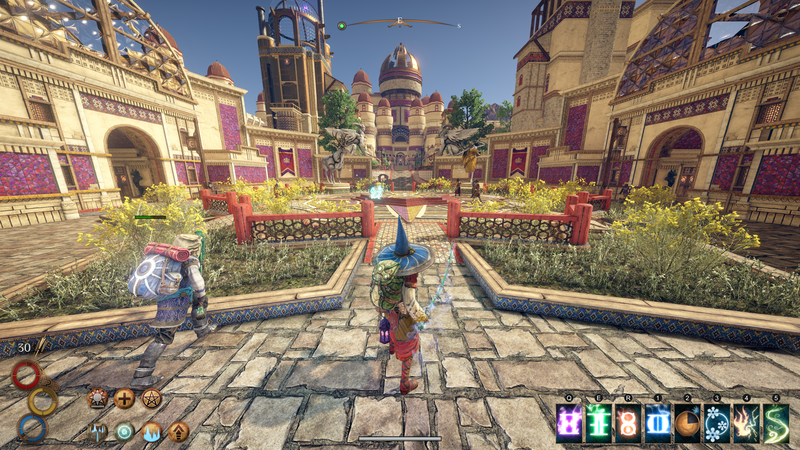 Outward offers a few important dialogue options, but the story takes a back seat. While this system seems serviceable on paper, it ends up feeling floaty and rough in practice. Animations that clearly whiff and miss the player will still seemingly count as a hit due what seems to simply be proximity-based collision detection of some sort. Items and spells often cannot be used while moving, which needlessly frustrates despite likely being intentional design -- imagine wanting to use an antidote to clear poison a shell horror just placed on your character, only for the monster to reapply it in one hit while you're stuck in place chugging the bottle or eating a curative. The same is true for trying to heal up with a potion. This results in two key things: passive restoration from food items ends up being the primary method of staying topped-off in the midst of a fight, and wanting to reapply a buff or use any item usually involves sprinting far enough away to know that the accompanying 'use' animation (drinking, eating, bandaging, or whatever) will finish before whatever you're fighting is able to reach you again. It ends up oftentimes feeling quite awkward until you basically learn to hardly ever use items in a fight, which seems incongruent in a game so heavily focused on item management. Watching the sun slowly rise over the horizon never gets old, bolstered by Outwards surprisingly good lighting system. 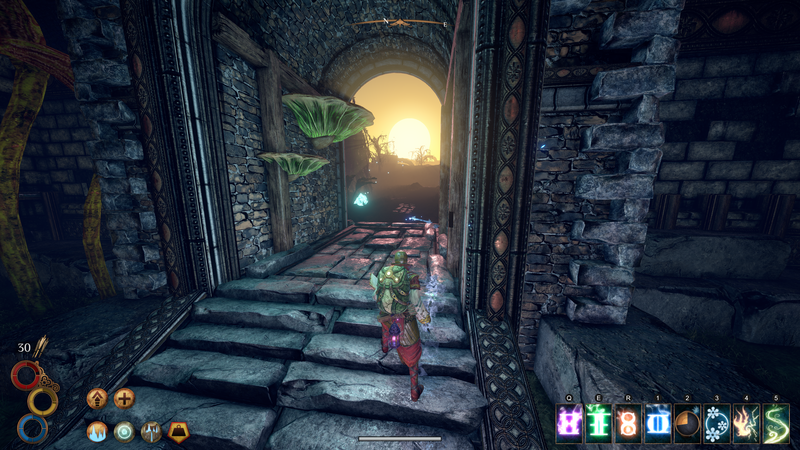 Combat falls apart a little more when Outward is played in two-player mode. Enemies have a very strict focus (or 'aggro') against the first player that they see, and will tend to not engage the second player until they take some threshold of damage from it. What this means is that two people can effectively abuse the AI and alternate taking the aggro in a way that trivializes combat in many ways. One person can take the lead and path enemies in a circle while the other buffs, heals, or lays traps. If both players are healthy, the non-focused character can just walk behind the enemy and use their strongest attacks without much risk at all. So there ends up being a wider difference than expected in both playstyle and difficulty from one-player to two-player. In the former, you'll often find yourself outnumbered and at the mercy of Outward's whim when it comes to avoiding hits and handling fights in general.